We’ve got a North facing garden, shaded by next door’s garage and four stories of Edwardian brickwork. There isn’t a lot of light back there, and the ground has a tendency to hold too much water because of the high clay content. I can successfully grow only two things – those Jurassic style ferns that seem capable of living in almost complete darkness and rhubarb. The clump of rhubarb explodes into life in the early months of the year and soon grows to a massive size, huge thick stems supporting vast umbrella leaves. Rhubarb is a very hardy plant…it’ll grow in the most unpromising of spots and tolerates all kinds of abuse and neglect. That said, a couple of buckets of horse manure in the autumn will guarantee a bumper crop come the spring. The trouble with this is that you’ve got to deal with a glut at about this time of year. Rhubarb freezes quite well, but freezing something fresh like this always makes me feel like it’s defeated me. Better to make something with it straight away. Rhubarb is very tart, and it benefits from being paired with a lot of sugar because of this. This cake gets the balance of sweetness and tartness just right. The heavy rhubarb sinks in the batter and ends up suspended just above the base, as the cake rises. Cream 140g of softened butter and 100g of light muscavado sugar together until the butter is light and pale. For a darker, richer cake, you could use dark muscavado instead, but the light version shows off the rhubarb well. Stir in 200g of golden syrup. Next, beat in two eggs, one at a time until they’re incorporated well. You need to give the cake a little more moisture to work with, so add 200ml of hot water, very slowly, beating all the time. It may look like an unpromising mess at this stage, but persevere. Sieve 300g of self-raising flour, a teaspoon each of ground ginger and bicarbonate of soda and two teaspoons of mixed spice over the batter and fold in. You may have to be more aggressive than you’d normally be, but carry on and hold your nerve. Wash and slice 300g of rhubarb into centimetre-ish chunks and stir into the batter. A little more rhubarb probably won’t hurt, if you’re really trying to get through the glut. Scrape the batter into a buttered and floured twenty-five or thirty centimetre cake tin and bake for fifty minutes at 180c, turning half way through. Check done-ness by sticking a knife into the middle and, hopefully, extracting a clean blade. Remember that there’s a load of rhubarb buried underneath that golden crust, so if the knife has bits of cooked rhubarb on it, that’s fine, just look out for signs of any raw batter. Let the cake sit in its tin for ten minutes before turning it out. I have tried rhubarb and strawberry cake, but not rhubarb and ginger cake. It does sound amazing. 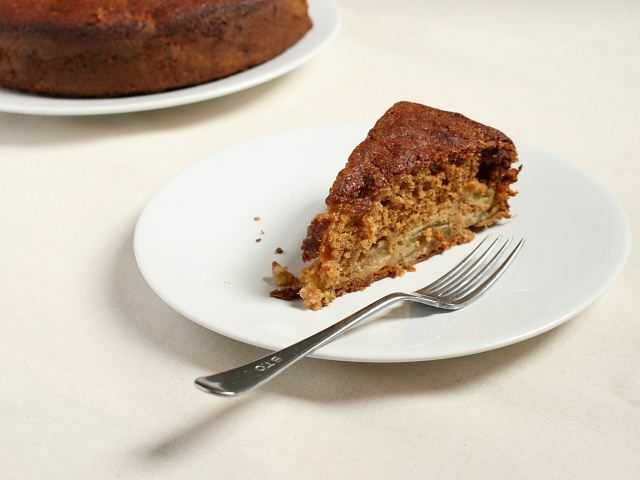 This cake sounds and looks wonderful…I found rhubarb growing behind my shed (a nice surprise!). It really does grow anywhere! Great cake! 1. That I had easy access to golden syrup. I see it occasionally, but never buy it because the opportunity to use it in US recipes is so rare. Now I wish I had. 2. That the recipe was converted for me!!! I'm lazy that way, but this could be worth the effort! 3. That my dear husband wasn't allergic to rhubarb!!!! Sorry, I only understand metric…only beer and milk should ever be measured in Imperial! Sounds very good! Will have to try this! I have yet to try rhubarb in my own kitchen, but if I do I'll have to make this cake! It looks so darn good! This looks amazing! Love all the rhubarb I'm seeing lately. Yum! Looks like a terrific recipe! Loved reading your post as it brought back memories of my grandfather’s farm and all the rhubarb we had (used to make rhubard/strawberry pies with it). I like your recipe with ginger and looks like just enough yummy sugar to make it perfect. Thanks for sharing.